1 Combine all ingredients except salmon in medium bowl. Reserve 1/3 of the mayonnaise mixture. 2 Grill or broil salmon, turning once and brushing with remaining mayonnaise mixture, until salmon flakes easily with a fork. 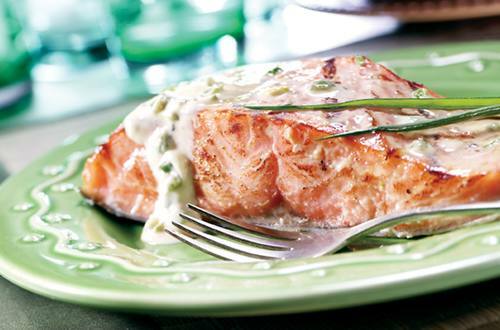 Serve salmon with reserved mayonnaise mixture and garnish, if desired, with additional chopped green onions. Also terrific with Hellmann's® or Best Foods® Light Mayonnaise or Low Fat Mayonnaise Dressing.